Years ago, I worked in Switzerland as an au pair for a wonderful family with 4 beautiful children. 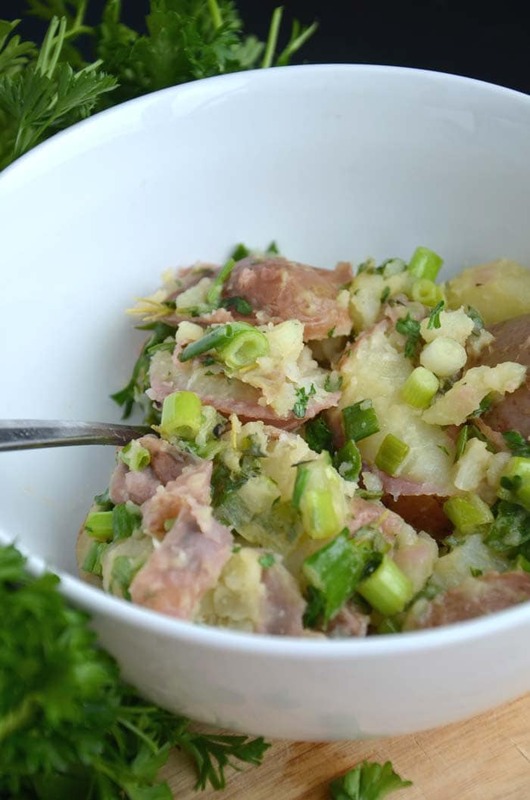 We used to have this amazing, delicious potato salad with our dinners and I loved it. 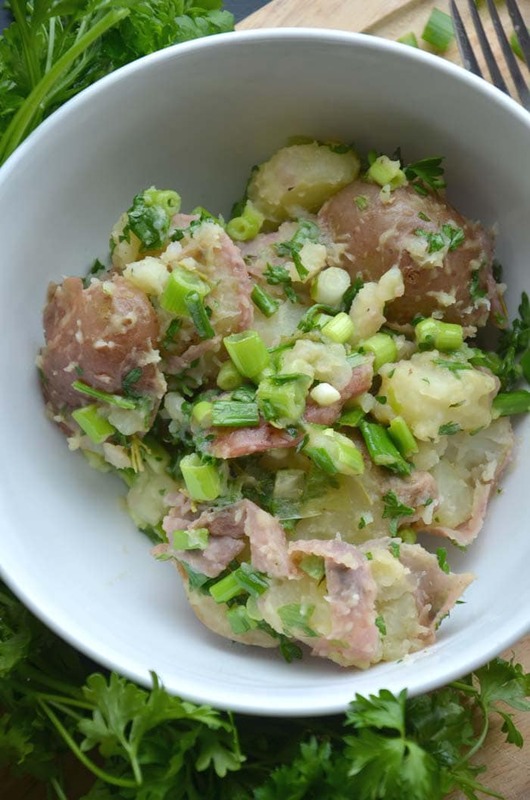 I never like traditional mayonnaise-based potato salad but when I first had that basic, tangy potato dish in Switzerland, I was hooked! 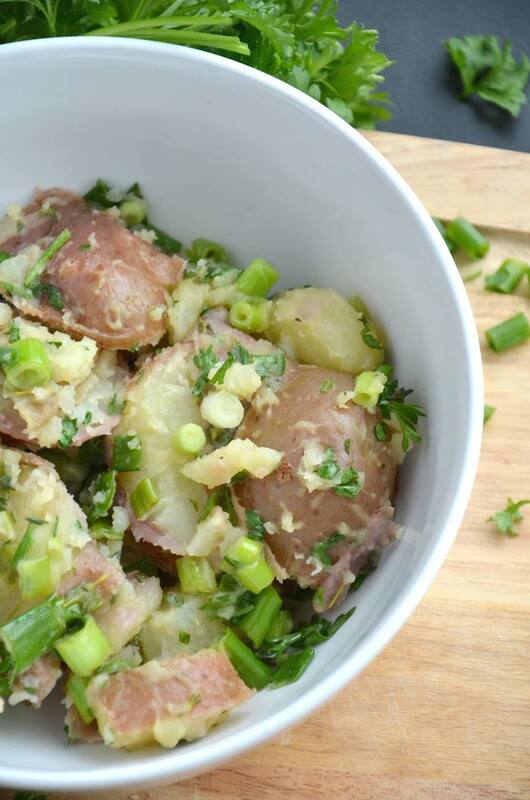 And so was born this Warm Potato Salad with Herb Vinaigrette. This salad isn’t exactly like the one we would have there (if anyone has a recipe for Swiss Potato Salad – puuuhhhllease, hand it over! I will love you forever), but it’s really tasty anyhow. It’s also really, really easy to make. Boil the taters, chop the herbs, mix the dressing and you’re done and done! This warm salad is so easy to make. All you need to do is cook the potatoes then mix them with the herbs and dressing. You can use parsley and green onions as I’ve suggested or switch it up with chives, basil, rosemary or thyme. You should have some extra dressing leftover which can be used on any other salad, roasted veggies or grain such as rice. Boil the potatoes until tender. Drain and place in a large bowl. 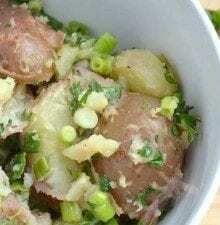 Add the chopped parsley and green onions. Add the vinegar, dijon mustard, salt, pepper, sugar, olive oil and thyme to a container and shake vigorously until well-mixed. Add about 1/2-2/3 of the vinaigrette to the potato mixture, there should be some left over which you can save for a later use.